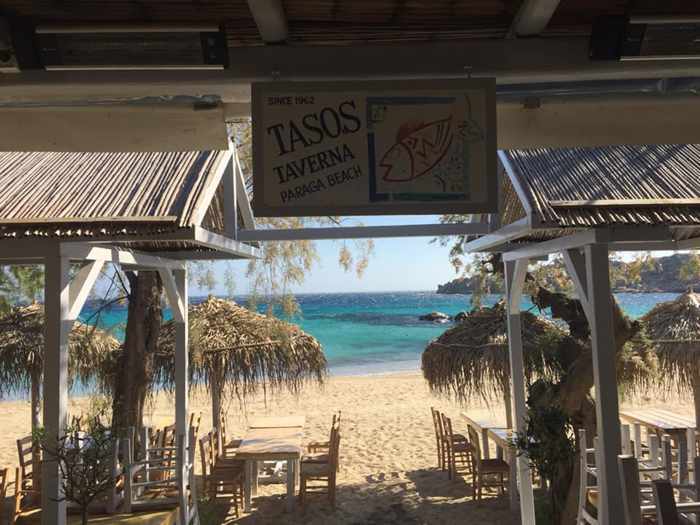 What’s happening: Summer is still several months off, but readers already have started asking me for information about Mykonos bar and club opening dates, party and DJ schedules, and other events. 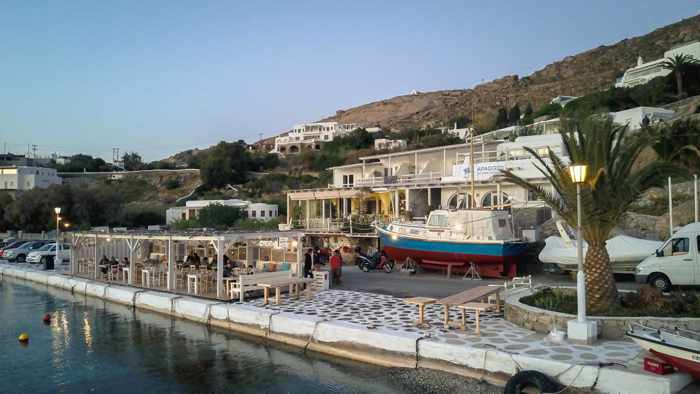 The island’s 2019 party season will unfold in much the same way as previous years: bars and clubs in Mykonos Town, and at some beaches, will gradually begin to open towards the end of April. 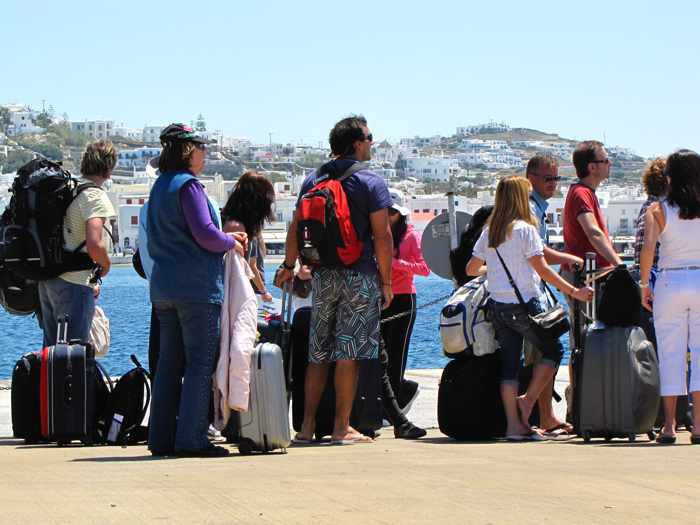 Greek Easter is Sunday April 28 this year, so the period from April 26 to 29 will be the busiest time on Mykonos for that particular month. 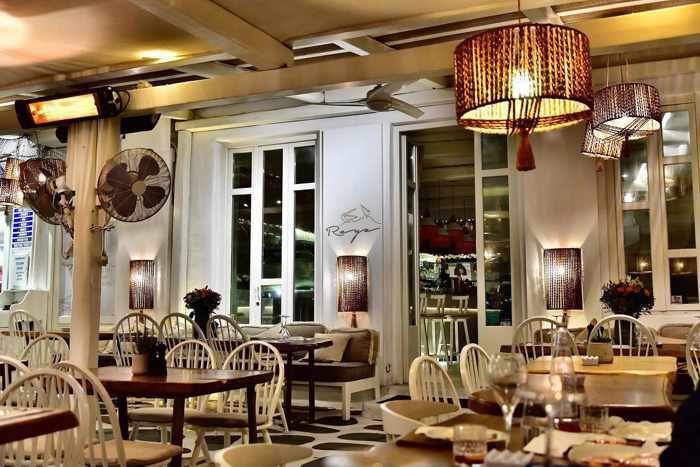 Many places will aim to open in time for the long holiday weekend, so the bars will buzzing with a lively Easter party vibe. Most town bars and beach clubs will open during May, and almost everything will be up and running by early June (though each year there are a few new clubs that get a late start and don’t open until early to mid-July). May and June are low season, so the party scene then is fairly low-key — especially in May. 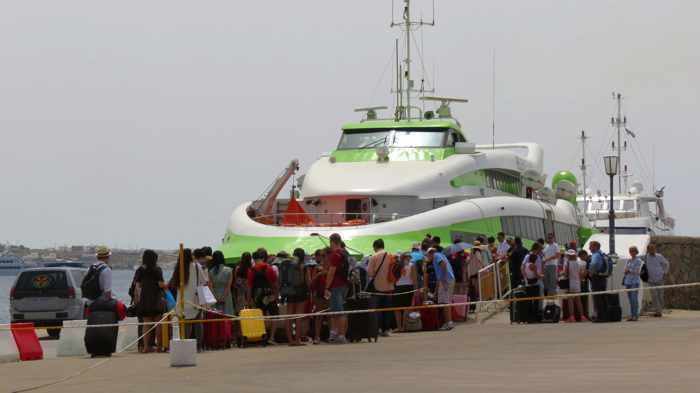 The partying revs up each week as more and more tourists arrive on the island, however, and by late June the crowds will be bigger and the bars and clubs will be absolutely bustling. Peak party season is July and August, with August being the wildest and busiest time by far. 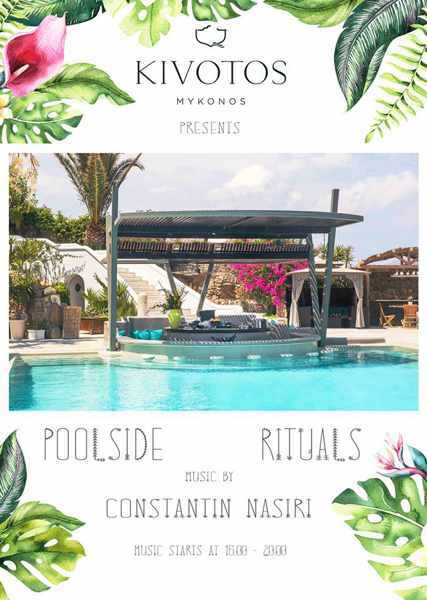 If you’re looking for frenzied, wall-to-wall crowds, appearances by the world’s top DJs, and non-stop partying from afternoon until dawn the next day, be sure to book your Mykonos holiday for either of those two months. Partying continues through September, but the pace of activity slows each week as the summer crowds gradually dissipate and the island’s bigger clubs start winding down and shutting their doors. 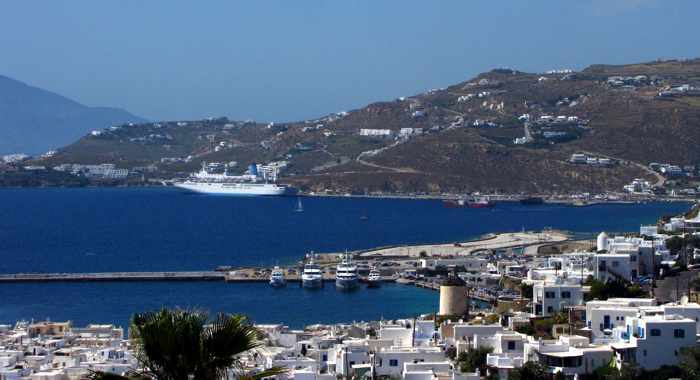 September is nonetheless a great time to visit Mykonos for a more relaxed, chill atmosphere, fewer crowds and congestion, and some sizzling season closing parties. 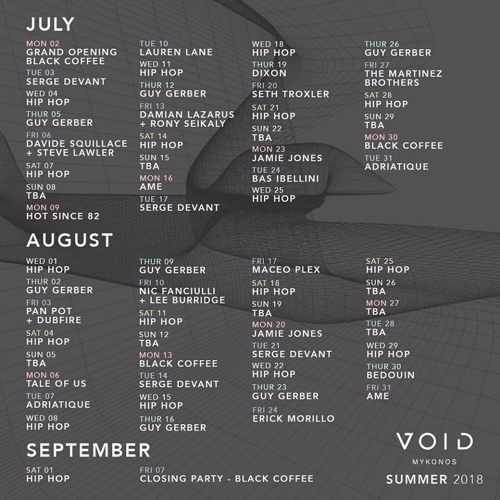 Last year, Void held its closing bash on September 7, with Guzel and Toy Room Club following suit on September 8. 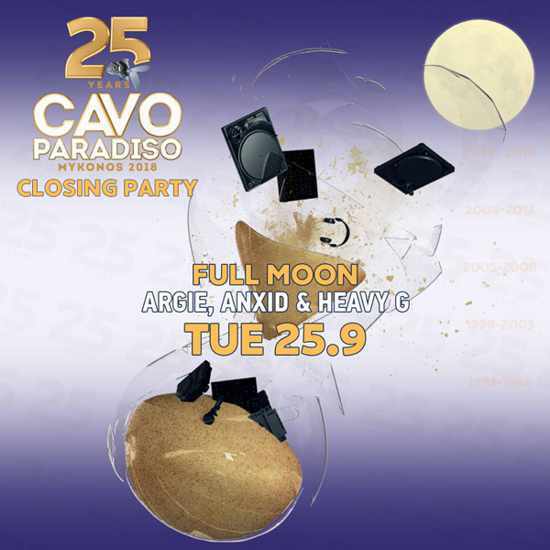 Club 4711, Sueno Pool Bar and The Garden Seaview Lounge all held their closing parties on September 15, while Cavo Paradiso threw its final event on September 25. 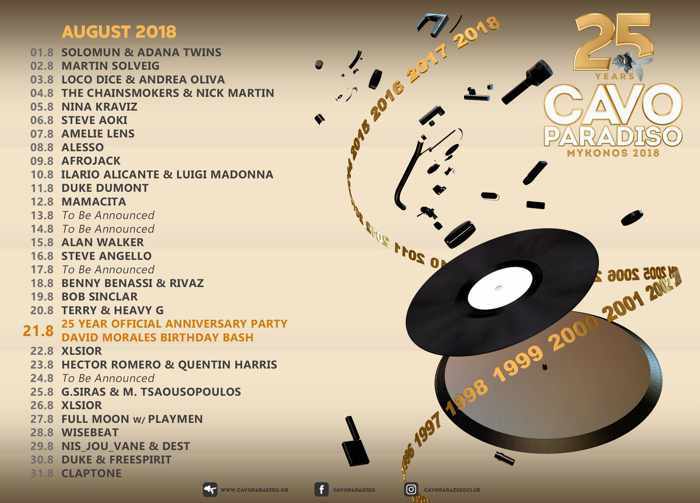 Babylon, @54, Queen of Mykonos,and Astra celebrated the end of their season on September 29, while JackieO’ Beach, Scorpios and Moni clubs closed their doors on September 30. A good variety of smaller bars and clubs will remain open into October, but most beach clubs and town bars will be shuttered by the middle of the month. 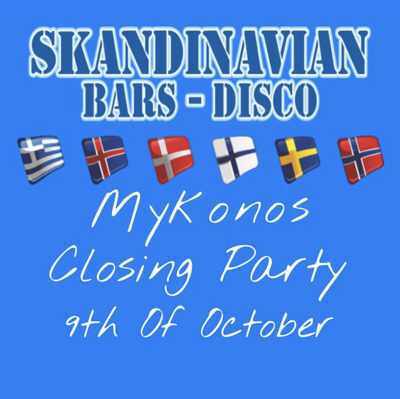 During the first 10 days of October last year, closing parties took place at Nammos, Semeli Bar, JackieO’ Town Bar, Alemagou, Kaula, Scarpa, Skandinavian Bar, Lohan Beach House and Bao’s Cocktail Bar. 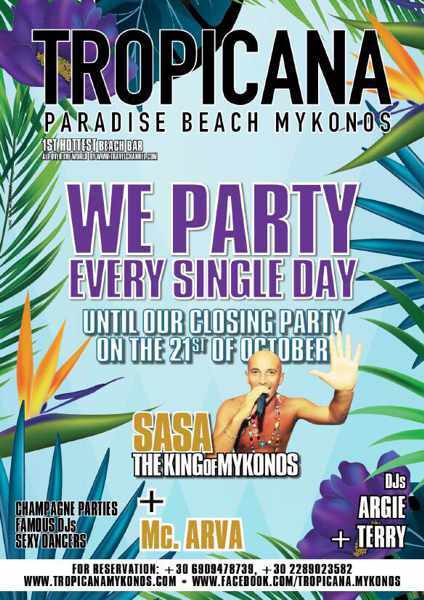 Super Paradise beach club and 180° Sunset Bar closed on October 20, while the final parties at Paradise beach took place on October 21. Partying after October was limited to a handful of small bars that stay open year-round for the local residents. If you’re travelling to Mykonos on a budget this year, plan to make your hotel or room reservations very soon — Mykonos is one of the most expensive places to visit in Greece, and the majority of cheap and mid-priced accommodations will be fully booked by spring. 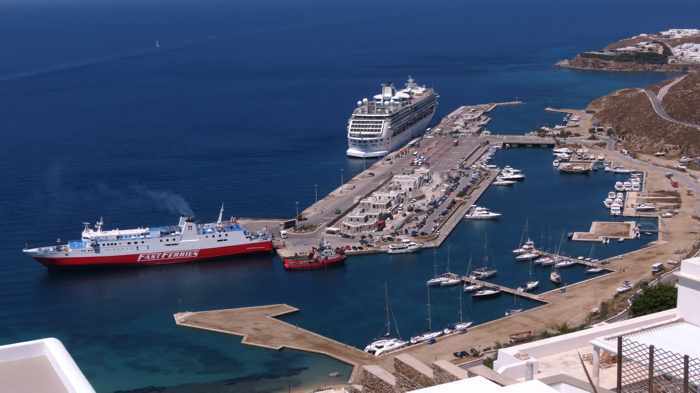 The only hostel in Mykonos Town, MyCocoon, is already accepting reservations for May 1 and onwards, while one of the top beach accommodations for budget travellers, Paraga Beach Hostel & Camping, will begin taking bookings through its website on January 15. I will be updating this post whenever bars and clubs have announced their opening dates and events, so check back from time to time during the winter to see what’s new. ♦ for information about bar openings and early spring parties in 2018, click here. ♦ for a list of events that took place in May and June of 2018, click here. 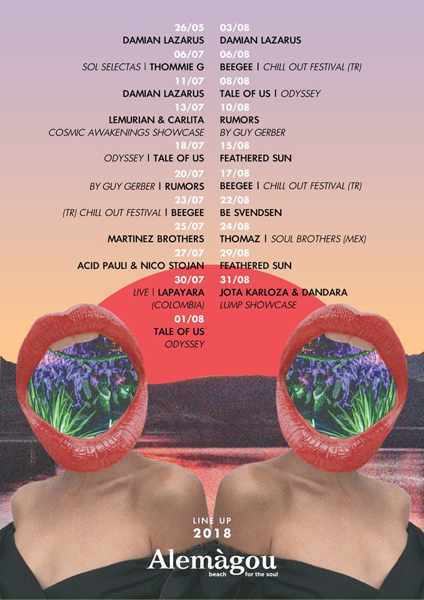 ♦ click here for a schedule of events that were held during August and right through the autumn. An exclusive new nightclub — Cirque Mykonos — will open this summer in the Little Venice area of Mykonos Town. No further details are available yet, but since the venue will be a Mykonos offshoot of the famous Cirque le Soir in London and Cirque le Soir Duba, you can expect a similar level of extravagant and exciting entertainment when it opens on the Island of Winds. 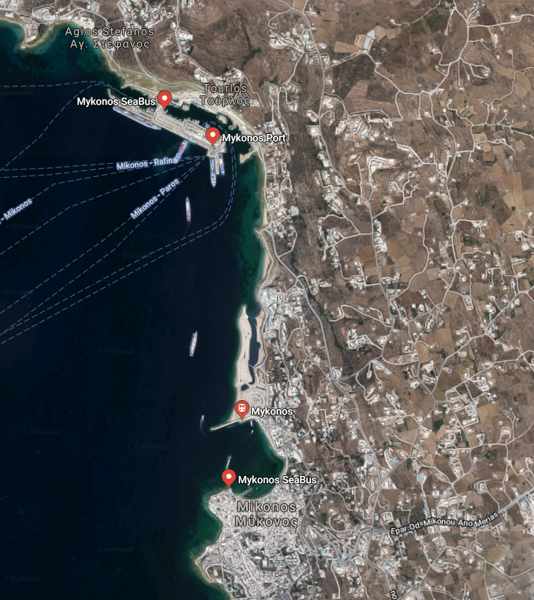 To see events scheduled for April, May, June, July and August 2019, please click on the link below to continue reading on page 2. Page 3 lists openings, parties and events that have already taken place (in case you want to see what you may have missed).